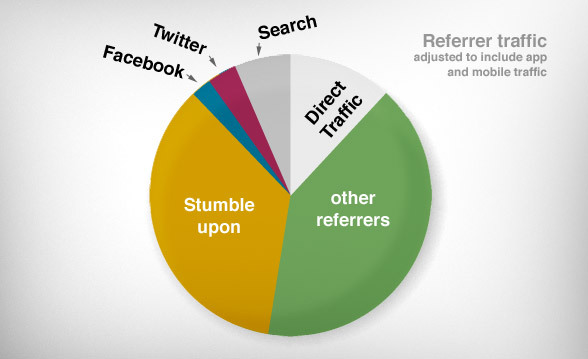 If you are using Google analytics (or another analytics service), you have a referrer graph similar to the one below. There is just one problem, it's wrong. 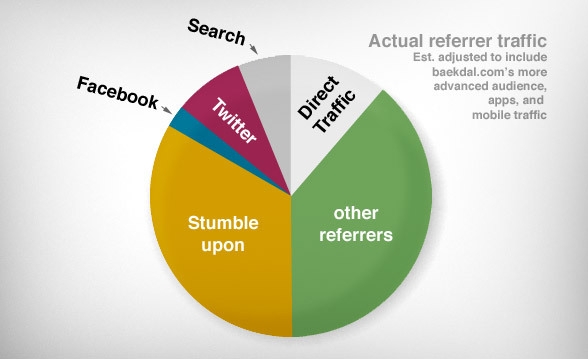 Every analytics package measure referrers based on browser traffic. That is, how many people visited your site, via some other page in a browser. But we are increasingly living in a world, where the browser is only one of many ways to read content. A good example is Twitter. As you can see in the graph above, Twitter accounts for about 1% of my traffic, but that is only the browser based referrers. We know that in general terms, only 25% of Twitter's traffic comes via the browser, the rest is via 3rd party apps and the API. And here is the important part. None of the Twitter apps will show up in your stats as something coming from Twitter. Instead, it shows up as direct traffic! The problem is even worse for social focused sites like baekdal.com, where my readers are far above average. Almost all of you are probably reading my tweets in an app, either on your computer, or on your mobile device. My guess is that 90% of my Twitter traffic comes via 3rd party twitter apps. This means that the above graph is only showing 10% of my actual Twitter traffic. This is not just about Twitter. You have the same problem with all the Facebook apps (including Facebook for the iPhone), most RSS readers, the Stumbleupon app for the iPad etc. 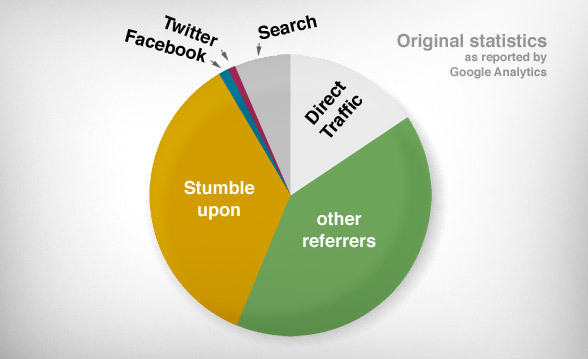 They are all showing up as "direct traffic" in your stats, not as a referrer from a social site. It is an important thing to remember. If you are looking at your social stats in your website analytics, you are not getting the right numbers. Here is what the adjusted graph looks like. The first one is the original, as reported by Google Analytics. The second is adjusted according to public figures of non-browser based traffic (75% for Twitter, and 50% for Facebook). The third one is adjusted according to the more advanced audience of this site. While Google Analytics is only reporting a little less than 1% of my visitors coming from Twitter, the actual amount is closer to an estimated 8%. BTW: Yes, Stumbleupon continues to amaze me. It provides many times more traffic than all other social channels combined. We need better analytics. We need something that can measure internet traffic, instead of browser traffic. And we need analytics that can measure across channels, instead of destinations. Ohh... and while we are on the subject. Jon Jantsch launched his new book "The Referral Engine" (affiliate link) today. I have not read it yet, but @chrisbrogan @guykawasaki and @zappos Tony Hsieh all praise it.